This pic was taken early this week by my friend Gerald in the back yard of one of St-Germain owner son. It seem that the truck after his active duty with St-Germain was used in the yard for a while than parked for several years. Gerald came in time for this pic since the truck is sold and was to be shipped along another old St-Germain truck ( KW K-100) to a country of Central America were they will start a second life. Sweet truck, still not fussy on the colour though! Tough looking old Bulldog. Would look neat hooked to that longbox in the background. It's a shame it's being exported. I'm sure someone would make a very nice restoration project out of it. I really like the color. Thank's Ray for the pic. I remember that they had one all dressed up. They use it mostly for show but once in a while we could see him pulling a trailer. He had a very special sound. I remember being overtake by him on TCH once. The following pic was taken in 2001. 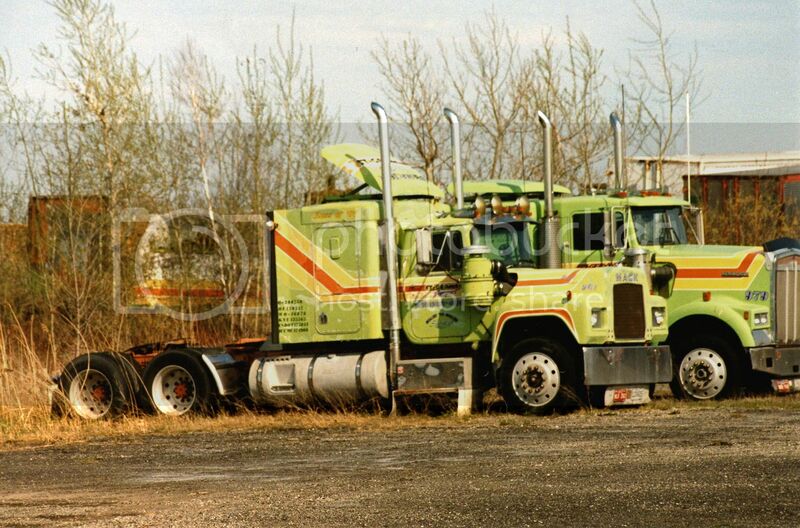 A few years later the truck was sold to Michael Duff from Waterloo Qc. He use it for a while then I lost sight of him. WOW !!!!! I WANT, I WANT, I WANT !!!!!! I Like Them Both !!!! 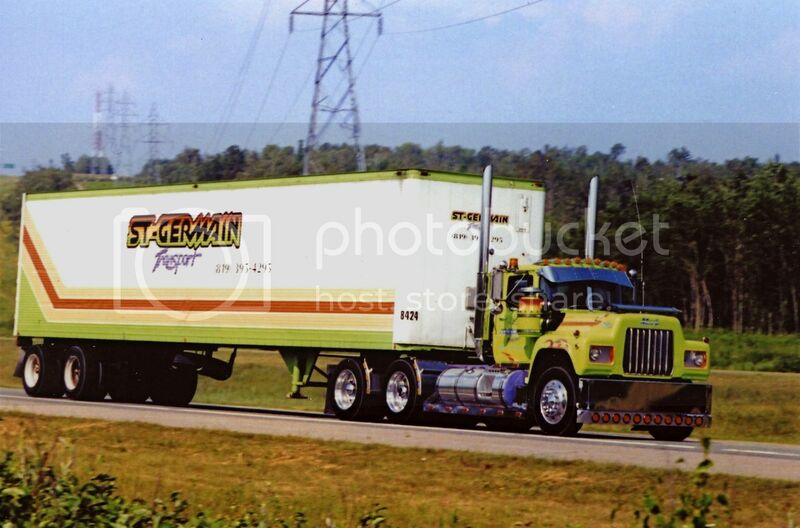 Here is another St-Germain Mack R. I took this one in 2002 in their auxiliary yard were they park out of service trailers and trucks. This truck was still there for quite a time after I took the pic. Last time I drove by the yard was crowded with old T-600 and FLiner Century. Needs some TLC but still looks cool. Is that the yard on the south side of the TCH? 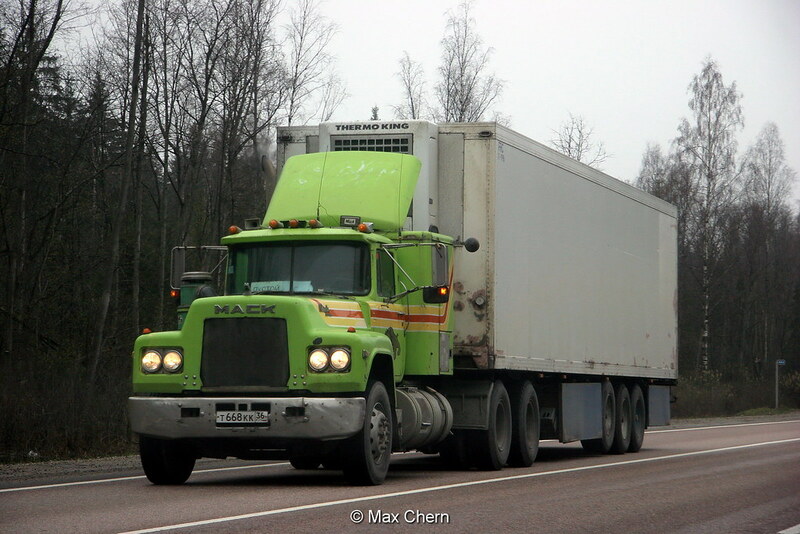 Is the white LTL 9000 still sitting in the yard? Yes Ray, it is the one. I have not been there lately. Last year they have removed 15-20 trucks from the fleet and they were all parked there. I should stop there when I get a chance and look closely at what is there. 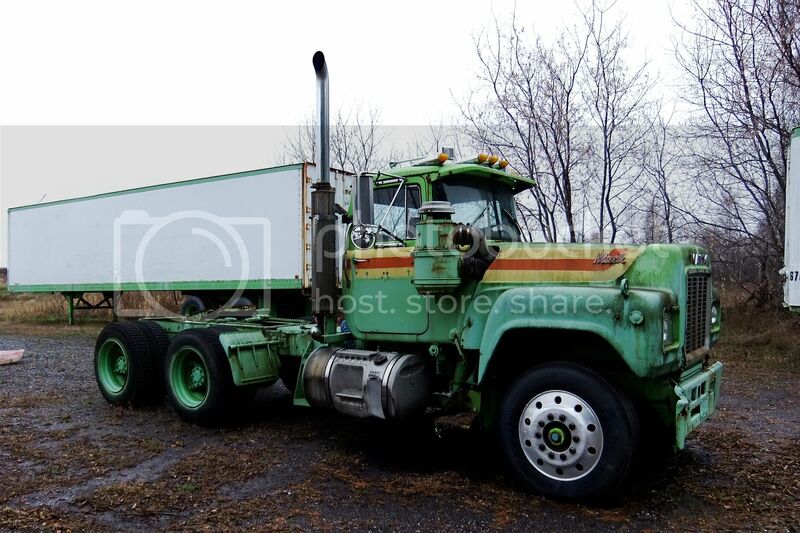 This guy liked a couple of my photos on Flickr and I found this old Mack R that looks like an ex-St-Germain model. Anybody with more knowledge than myself could verify? Apparently it's found a second life in Russia as of 2008. Cool photo! 2nd life indeed. I bet it was a SGT 2000 inc, back in the day, St Germain was pretty small, and the way and the color of the stripes, to me, look more SGT 2000 than St Germain division but can't really tell. R&G Ellis used to have a Main Page album full of Quebec carriers, but that seems to be gone. The photo below is St Germain Express....stripes are a little different than yours, but still similar. Here's one of Gary's shots I found, I can definitely see that being a SGT Mack. Thanks for the correction!